Is the wood you are chopping too hard to make cleaner cuts with a few swings? If this is the case, it’s time you added a tool to your arsenal, the best wood splitting wedge. Whether you know it or not, wedges are in fact better than professional chainsaws or folding saws for split hard wood and large logs that an axe can not split. So with so many types and brands of log splitters or wedges in the market, choosing the best one can get confusing. This is why you should arm yourself with some information and features about wedges, its manufacturers and tips for choosing them before heading to the market to buy one. This buying guide was compiled with the same intention, to help you make the right choice. Best Wood Splitting wedge choosing guide – What to look for ? What Weight should be ? There are a few points you need in mind to choose the best wood splitting wedge. First of all, choose based on what and how you plan to use it. You need stronger steel wood chopping wedges to chop logs while durable plastic wedges are perfect to place into kerfs to prevent pinching and to direct the fall of the tree after cutting. You also have to choose based on whether you need a four-edged or one-edged wedge based on how many pieces you want the wedge to cut the wedge into.. Looking for help cut and fell your trees? If this is the case, then the 5.5” Gator wedge may be just what you are looking for. This is a wedge that is made in the USA using High Impact ABS Poly material and is available as a pack of two wedges. The Gator wedge is a felling wedge that is 5.5” long, and helps in the safe and easy felling of small trees by directing the tree to fall in the direction you want it to fall. This proves very helpful while felling trees as they not only help guide the direction for the tree to fall in, but also prevents the tree’s weight from pinching your chain saw bar and chain. While one side of the wedge is smooth, the other side comes with serrated barb. This is an important feature in the wedge as it plays a crucial part in holding the wedge in place once inserted into the wood. You need to know that as the wedge is made of ABS poly-carbonate, it is quite stable even while under a load. In fact, this is the reason it doesn’t break easily. Looking at all these features of the wedge, felling trees seems to be so much easier with this pack of two Gator wedges in your tool arsenal! Fed up of trying so hard and using so many wedges to split some of the toughest logs? Then it’s most probably because you haven’t tried the Estwing 9” E-5 sure split wedge yet. This is a splitting wedge that has a revolutionary design of a 1-7/8” cutting edge, making it the perfect splitting wedge to use to split stubborn and knotty wood logs. 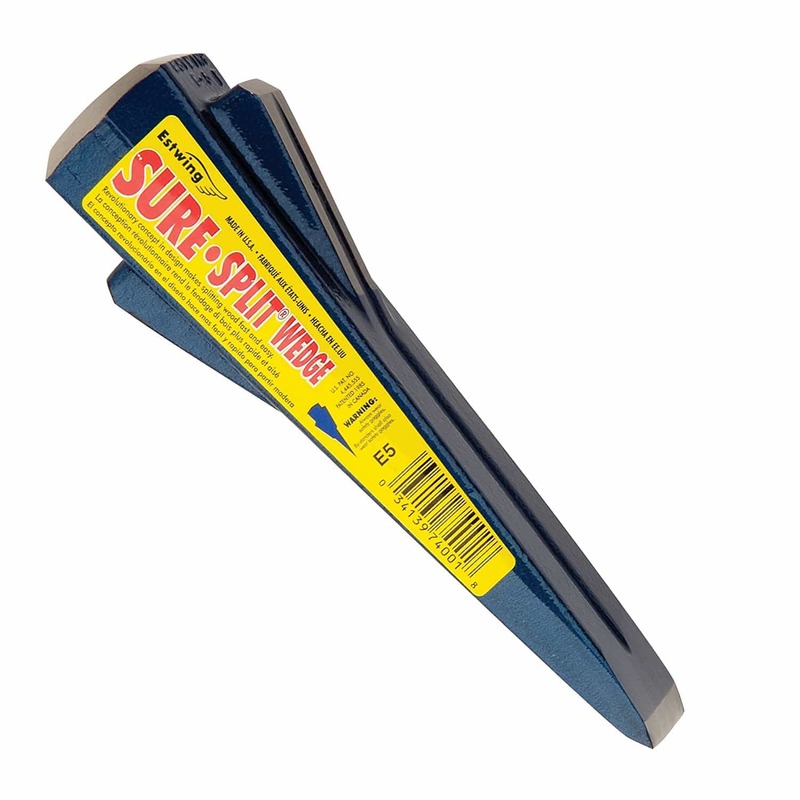 Its fast tapered head gives an easy start as it helps the wedge to easily lodge into the wood. And its extra Sure Split fins provide an extra and firmer wedge action for continuous and effective splitting. The US made wedge weighs 5 pounds and has a total length of 9”, from the cutting edge to its head. It’s made by the Estwing Company, an American company famous for producing high-quality wedges, axes and mauls, thus assuring the wedge’s quality. Once its sharp cutting edge touches wood, it holds for as long as it’s wedged in. A very strong wedge, it easily cuts through even the toughest logs while it’s double fin feature helps further split the log even after its wedges into the wood. Besides, the fins offer the added benefit of ensuring the wedge doesn’t end up stuck into the wedge while cutting through it. There’s the risk of the wedge bouncing off the wood if improperly positioned. 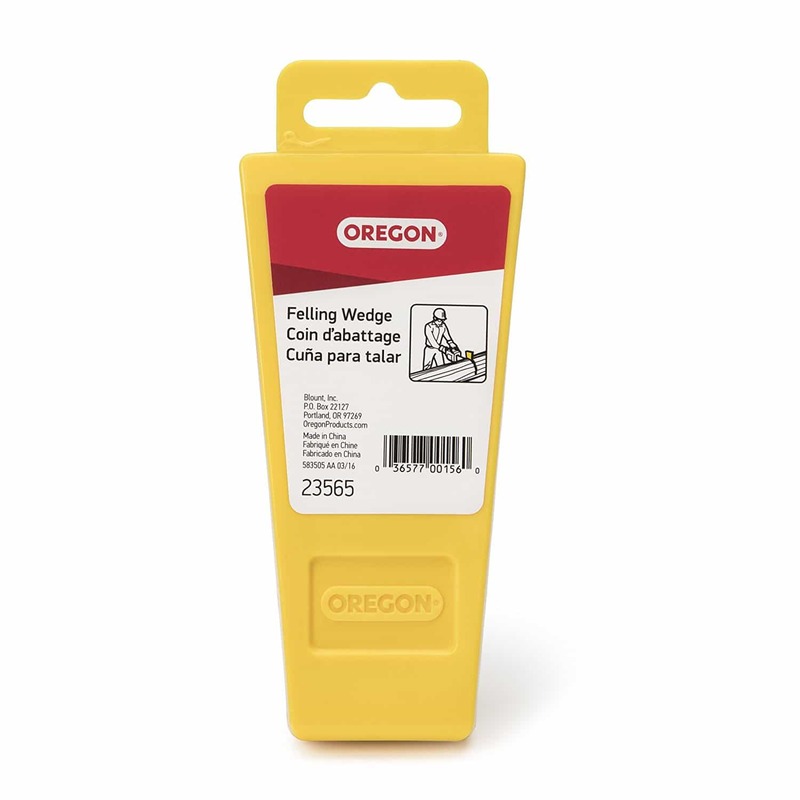 The ​Oregon 23565 tree felling wedge is a tool you need to keep handy while felling and buckling trees. This is because there is always the possibility of your chainsaw getting stuck while cutting trees, which this wedge can prevent. With the Oregon 23565 in hand, it provides a solution to the problem as it can be driven into the tree to loosen the chainsaw, and make it easy to pull out. This wedge is made of lightweight but durable plastic which also helps at ensuring the tree falls in the right direction while felling trees. This helps prevent many an injury, and also prevents the possibility of any saw binding while cutting trees. Once it is placed in the kerfs while sawing, it helps keep it open and thus prevents saw binding. However, it’s not advised to use the wedge for splitting wood as it’s not designed for it. It’s only meant for tree falling and buckling. The wedge has some barbs on them which prove helpful at preventing the wedge from backing out when in use. As it’s made of plastic, there’s no worry it damaging hammers and mauls while hitting it. Deceptive description wherein it states a pack of 3, but you end up with only 1 wedge. Tired of splitting wood with your splitting maul? Why not try doing it with the help of the Ludell 11605 High Grade steel splitting wedge? This is called a traditional log splitting wedge not because it doesn’t have any fancy spins or serrations, but because it’s designed just like the wedges our ancestors had created years ago. You may call it a classic wedge, which weighs 4 pounds and boasts of high-grade steel construction. It’s, in fact, responsible for the wedge’s added strength and durability. It’s reasonably priced, making it ideal for easy wood splitting chores. It is a drop forged, enamelled and heat treated wedge, designed to quickly split both medium and large sized logs with improved precision and efficiency. Though it has a primary, rust-resistant head, it works well with both sledges and mauls. It is strong enough to withstand the blows of an axe or sledgehammer as it splits and cuts through wood. The edge is not as sharp as expected because this is a wedge which is not meant to be sharp in construction. It’s intended mainly for splitting wood with the help of a sledgehammer, maul or axe and is not meant for cutting wood. The task of splitting wood is so much easier with not just any wedge around, but with the Collins Diamond Shaped wedges around. Manufactured by Truper Garden Tool, this wedge boasts of optimal work efficiency. This is why it’s even nicknamed a ‘grenade’ because it splits logs in not two ways, but in four ways. It’s its four fins with a diamond shape, found at the head of the wedge that is responsible for splitting logs in four ways. 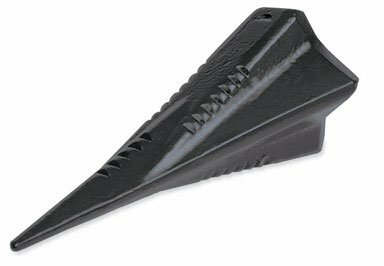 wedge Besides, this is durable in function as its edge is both sharp and pointed. This ensures the wedge lasts and serves you longer. The Collins wedge is 7” long and made using heat treated, high carbon steel. Its edge is so sharp that it ensures you can break wood without too much of exertion or pressure. In other words, if you are looking for speed and efficiency in your wedge, this 4 lbs. Collins wedge is just what you are looking for. Light but durable in structure with a weight of 4 lbs. Fed up of spending so much time splitting wood? Well, there’s help around in the Swisher 4-way log splitter wedge 188840 that helps reduce the time spent. Your log cutting capacity is improved thanks to its 4-way wedge. The Swisher wedge wood splitter is made in the USA using high grade steel. it can be easily used in the horizontal position when slipped over factory wedges to reduce your log splitting time. It however, is not compatible with 22 ton splitter with log strippers. It splits more wood in less time as it quickly splits logs into 4 pieces with one hit. It however fits Swisher 28 & 34 ton log splitters and if used with a flat beam and bolt on wedge, it may fit 22” models too. When you think of a wedge, the first thing that comes to mind is a flat wedge. However, there are also wedges a four-way design like the Ames True Temper 4 lb. 2414200 torpedo wedge. This wedge is much more effective than traditional wedges because it’s four fins splits wood in four and not two directions for improved log splitting. The True Temper wedge is 7 inches long from its edge to the wedge head, and is made from forged steel. This is why this wedge is strong enough to take repetitive pounding and easily digs into the wood to make splitting wood so much easier. With this wedge’s head divided into four fins, it splits logs in four ways for more effective wood splitting. Despite its wood splitting efficiency, it’s rather small in size, making it perfect for cutting wood into small pieces. This doesn’t’ mean that it can’t be used on bigger logs. It’s, in fact, safer on the bigger logs than smaller ones. It’s mainly attributed to its sharp pointed head that easily cracks and splits logs. The teeth edges on its sides help the wedge grip onto wood while splitting logs. With so many types of wedges available in the market, even these wedge reviews may confuse you when you have to finally choose the quality splitting wedge. This is why this buying guide has been compiled, to help you make your choice based on various features such as its construction, weight, design, and of course, its features. Buckling and felling wedges are usually made of heavy duty plastic which does not damage the chain saw or cutters in case they accidentally come in contact. But they do get misshaped and damaged rather quickly, and misshaped or damaged wedges have to be replaced to prevent injury from small flying plastic projectiles. 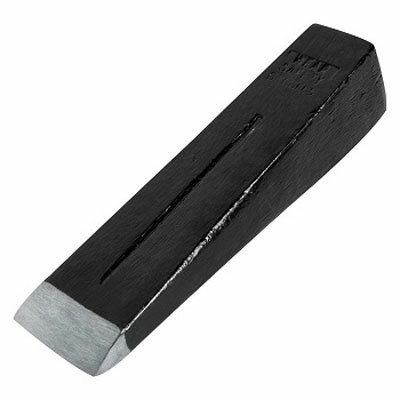 In case of force wedges, they are generally made of forged steel, which is both durable and strong enough for splitting wood efficiently and with accurate precision. There are also wedges made of ordinary soft steel that tends to dent or get deformed when hammered. Soft steel wedges are however necessary because the repeated hammering of ‘hard steel’ wedges can damage or break the steel maul, sledge or ax. Considering this aspect, soft steel wedges are comparatively protective and safe in nature to use while splitting wood. Wedges come in different weights, which you have to choose based on the type of wood you will be splitting. Generally, wedges weighing 5 or 6 pounds are perfect for cutting most woods. You will need heavier wedges if you have more wood splitting work to do, and if you are cutting larger logs of wood. Wedges are traditionally found as flat wedges with blades, but there are also round or diamond splitting wedges called ‘grenade’ which are more effective at splitting wood. The grenade is a heavy iron wedge with a pointed edge that can effectively split well rounded logs into 4 parts with a single shot. They are best used when the log is practically split open, and needs to be finally blasted apart. These wedges have a slight twist which helps split wood. They are however not that useful to start a split except for small logs that are about 6” in diameter or less. They, however, do quicken the job as they split logs into four pieces with each hit. Most wedges don’t require much maintenance, except for the occasional sharpening. As mentioned above, the wedge needn’t be too sharp. The wood splitting wedges have to be robust and durable, and not brittle in construction. Only then will they be able to produce the light ‘bounce’ needed when it is struck with a maul. Besides, it’s only a durable wedge which can absorb the hammering force, while maintaining its shape even after years of use. It should also be designed so that it will not ‘bounce’ out of wood upon making the first strike. This is not only dangerous to you and people around you, it’s also frustrating as you will have to periodically pick up and place the wedge in position to split the wood. It’s also worth taking the splitting wedge’s brand into consideration while making your choice. Some of the common brands are Estwing, Garden, Ames, Truper, Redneck Convent and Fiskars which are worth investing in. Cost is always a factor to bear in mind, while buying anything, including wedges. Sometimes if you want the best wedge, then cost may not be that much of a consideration. If you are on a budget, look for a medium-priced wedge while checking and ensuring its quality matches its price. So now that you know all about splitting wedges, and have gone through reviews of the best wedges in the market today, you should find it so much easier finding the perfect splitting wedge.The Collins Diamond Wood Splitting Wedge Heavy-Duty Steel wedge which makes 4-Way splits is a wedge worth investing in. it helps cut stubborn logs into 4 pieces, to quicken the chore of splitting wood. It’s also strong and durable wedge that will serve you for a long time to come. While the Collins Diamond Wood Splitting wedge is a good investment, instead of buying only the best wood splitting wedge, it’s better to have a few wedges always at hand to choose and use as required. 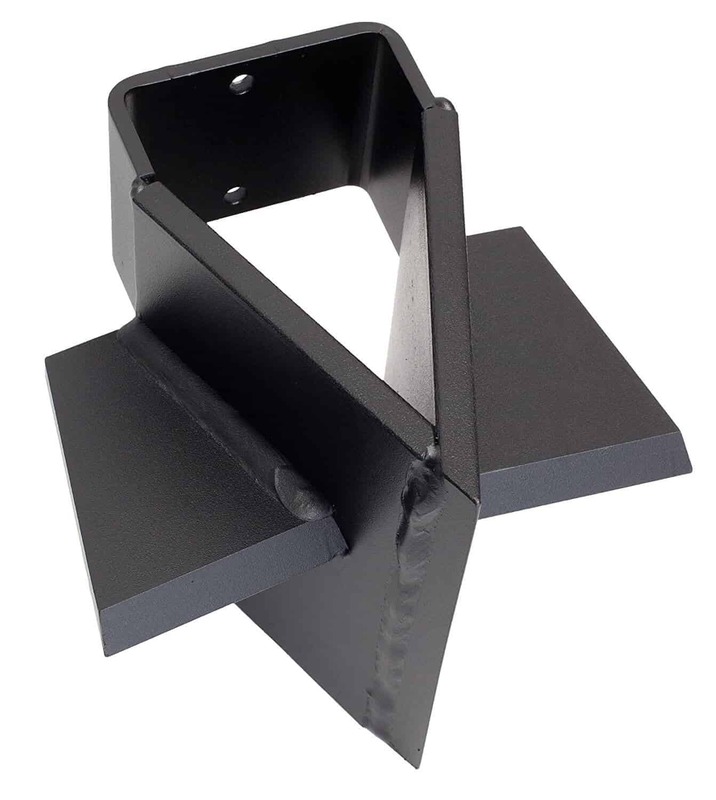 If you think that metal splitting wedges are more than enough for splitting wood, sometimes you may also need plastic ones to keep kerfs in place while splitting wood!